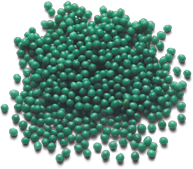 POLYON® controlled-release fertilizer with its trademarked green color is backed by years of research, and for decades has been the market leader in the turf and ornamental markets. 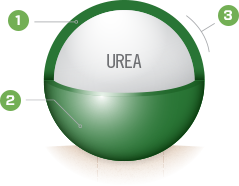 The key to its performance is the Reactive Layers Coating technology which meters out nutrients via diffusion, regulated by soil temperature and coating thickness. Over time the dissolved nutrients slowly release through diffusion, only when triggered by soil temperature. After the complete release of nutrients, the polymer coating eventually decomposes by microbial activity into naturally occurring soil elements. POLYON® controlled-release fertilizer is formulated for turf, landscape and nursery applications. Release specifications for 80% total nutrient release at 86°F.